Here is a fact I recently found astonishing: one in every nine holidays taken globally is a cruise holiday. 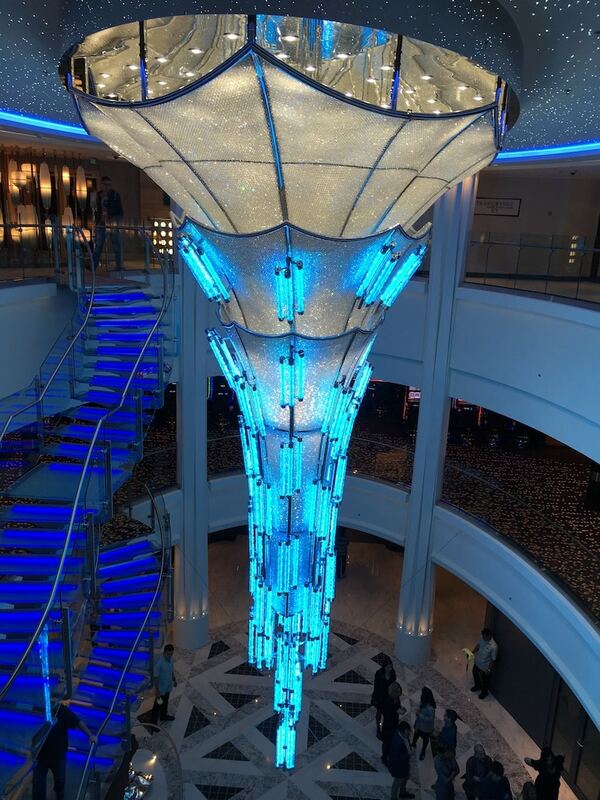 And after being aboard Norwegian Cruise Line’s (NCL) latest ship for its inaugural cruise to explore and take in its innovations for this Norwegian Bliss review, I have a greater sense of the popularity of holidaying at sea. If you are new to cruise, you are in for a great surprise. If you have been on cruise holidays before – visited numerous ports of call, sampled a ship’s many restaurants, enjoyed the entertainment and (some unusual) attractions, you already know what a good experience it can be. 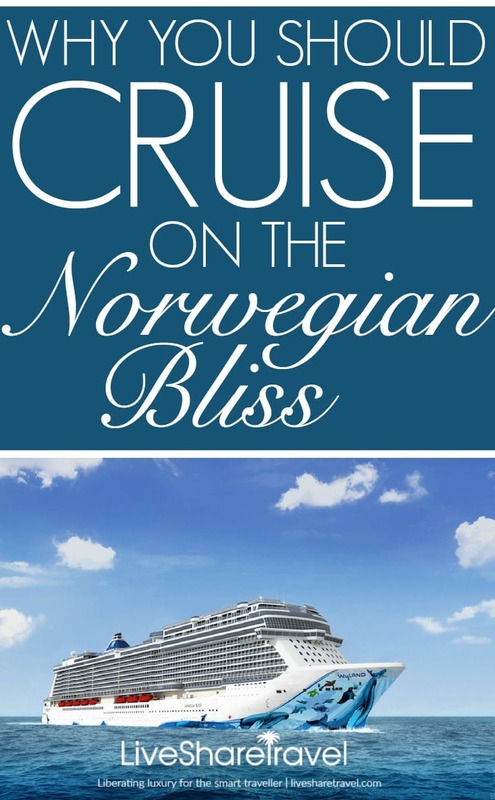 We’ve cruised before with Norwegian Cruise Line and really enjoyed it. But with the launch of Norwegian Bliss, whatever you think you know about cruising – be prepared for things to take yet another step forward. I joined the ship at the Bremerhaven Cruise Terminal, in Germany, for a two night sailing back to Southampton. Crowds thronged the quayside, to cheer us off on the maiden voyage. Flags waved fervently as Norwegian Bliss slowly weighed anchor and gently slid away from the dockside. Traditional oompah music blared through the warming evening air, as Bremerhaven’s skyline slowly shrunk into the distance and we began our journey. With the launch of Norwegian Bliss, once again the cruise experience has been significantly elevated. There are a plethora of things to do on board the ship and so the hardest thing is deciding what not to do. From dining to wellness, casinos to shopping, and sports to Broadway shows, the list goes on and on. That list includes delicious dining options at an array of restaurants including seafood at Ocean Blue, grills at Cagney’s Steakhouse, Japanese at Teppanyaki, Italian La Cucina, and a whole fusion of global foods at Food Republic. I for one can vouch for Los Lobos, specialising in great Mexican food. There are far more eateries to choose from including less formal dining, such as mainstream buffet restaurant, Garden Café, which still offers fabulous quality food. You can also kick back with a drink and relax or even dance if you prefer at a number of bars and clubs. I visited the Cavern Club lounge, which is based on the legendary Cavern Club in Liverpool, where the Beatles played in their early days. A Beatles tribute band, dressed in Sgt. Pepper’s era clothing played hit after hit from the Fab Four. There was also the Cellars wine bar, Skyline bar, the District Brew House, Sugarcane Mojito Bar, and a host of other great places to enjoy yourself, so plenty of choices for bar-hoppers. For the night owls there is also the Social comedy and nightclub. On deck eight is The Waterfront, a quarter-mile wraparound oceanfront promenade, first featured on Norwegian Escape, offering alfresco dining and dramatic sea views at seven of the ship’s bars and restaurants. High up on Deck 15 is the huge indoor Observation Lounge, with wonderful 180-degree panoramic views. With over 3,500 square feet of floor-to-ceiling windows you will miss nothing. 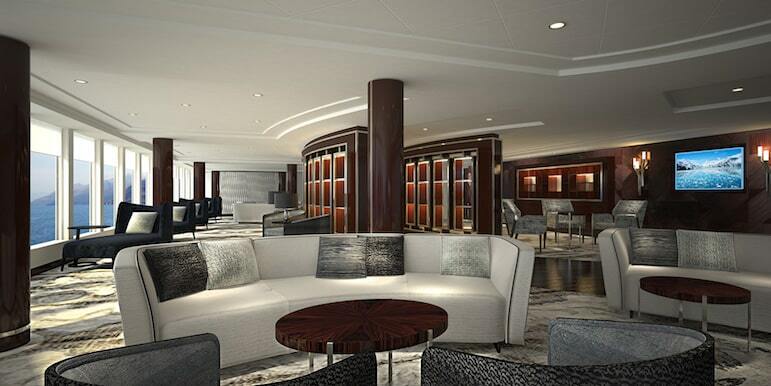 Having been there and savoured the views out to sea, it is clear the Observation Lounge will be a major advantage when the ship visits destinations such as Alaska. It will also be ideal for beautiful sunsets as it sails the seven seas. It is perfect for those wanting to take in the sights at a leisurely pace, amid great comfort, while enjoying the full waiter service. When you want to expend some energy there is a running track, swimming pools and Jacuzzis surrounded by plenty of sun loungers, and an Aqua Park with two multi-story waterslides. There’s even an open-air laser tag course for a bit of excitement. The array of shopping options on board was very impressive as was the extensive Mandarin spa and fitness centre. There relaxation is inevitable with 50 treatments available from an array of therapists, including massages, manicures, pedicures and facials. Other treats in this heavenly oasis are the sauna and steam-rooms in the Thermal Suite, a vitality pool, salt room, and if you get too hot there’s even a snow room – I took a pass on that one. However, the standout feature for me was the go-karting race track on the top deck, on which you can hit speeds of up to 30mph. Great fun for anyone who fancies being a budding Lewis Hamilton. It certainly was a fabulous sight to behold when out in the middle of the ocean. After dinner each evening Norwegian Bliss offers up first class entertainment in the Bliss Theatre. One night I watched a full Broadway production of the musical hit the Jersey Boys. highlighting the rise of Frankie Valli and The Four Seasons. The show follows them from the backstreets of New Jersey to worldwide acclaim with hit songs such as Oh, What A Night, Big Girls Don’t Cry, Walk Like A Man and Can’t Take My Eyes Off You. The following evening the show was Havana, an original production developed by the cruise line with help from Emmy and Tony awarding winning producers, writers and composers. Norwegian Cruise Lines believes it could take off and soon be hot-footing it to stages around the globe – the first time a ship led production would transfer to New York’s Broadway or London’s West End as opposed to the other way around. Whatever its future is, the whole audience enjoyed the show which highlighted the vibrancy of Cuba in the 1950s. Havana, pulsates with the seductive rhythms of Latin American music and sultry dance moves. I thought it was an excellent show. 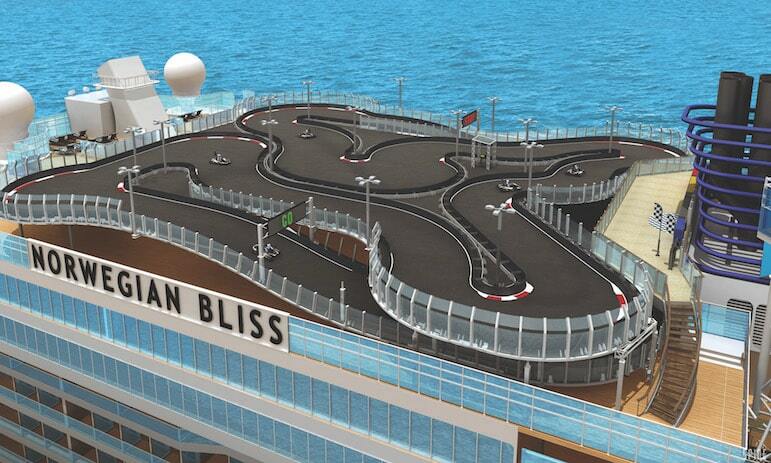 Norwegian Bliss has 20 decks, 2,038 staterooms and can carry 4,000 passengers. I stayed in a fabulous stateroom on deck 15, which had its own balcony. As the weather was gloriously sunny, it was lovely to sit out on the balcony and just breathe in the refreshing sea air, while listening to the quiet of the open ocean. My stateroom could easily sleep three people, and as I was alone, I had plenty of space to myself. There was also a large flat-screen television, sofa, a great bathroom with double washbasins, large shower, and internet connectivity. Storage aboard ships can be an issue but I had ample space in the wardrobe to hang clothes, there was good shelf and drawer space, as well as room to put my suitcase away in the wardrobe. 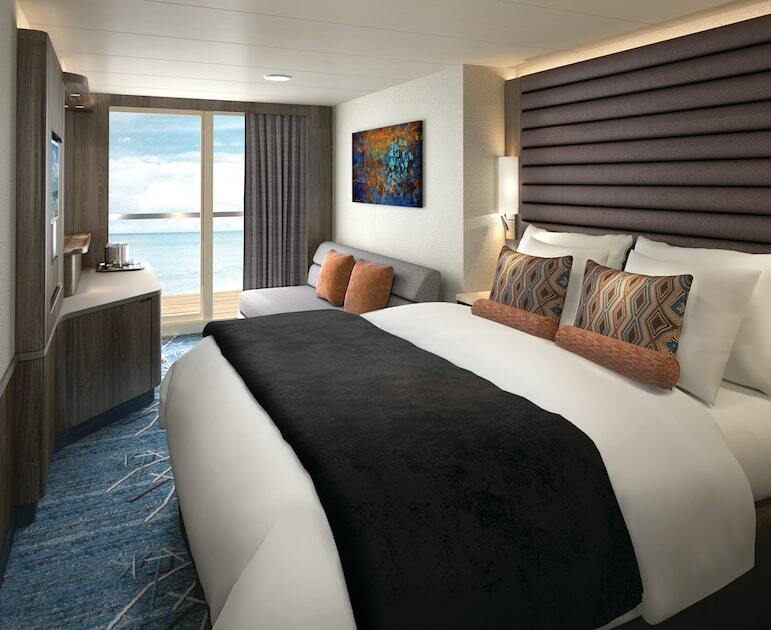 If you are a solo traveller then Norwegian Bliss has 82 inside cabins designed especially for you, each with virtual ocean views. Not only that, but solo travellers also have exclusive use of the Studio Lounge, a place for relaxation where they can have a drink, order room service, watch the big-screen TV and meet neighbours. Our crossing from Bremerhaven to Southampton was extremely smooth with very calm seas and a whole host of activities to keep even the most fidgety among us entertained and enthralled. The ship’s staff could not have been more helpful, the food was superb and while Norwegian Bliss is a luxury experience it remains informal and not at all stuffy. Guests can eat at any of the ships restaurants and there is no formal dress code so no need for evening gowns or suits. I was particularly was impressed that Norwegian Cruise Lines have introduced an all-inclusive policy which now includes all drinks and tips. I would certainly be interested in returning and sailing aboard her once again. 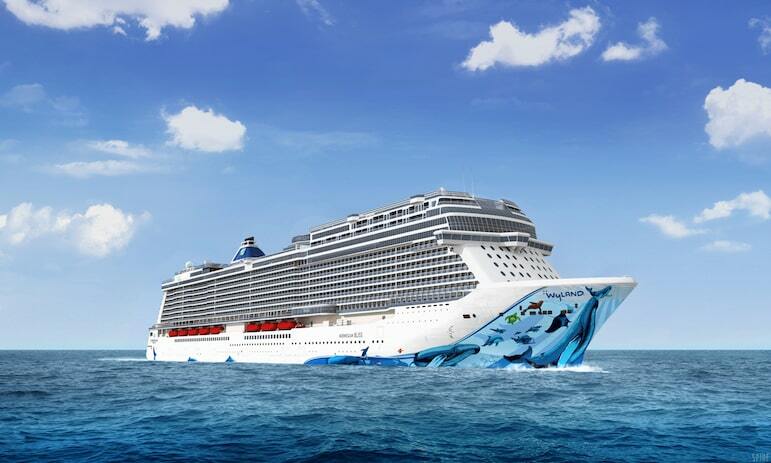 Norwegian Bliss will be sailing itineraries to Alaska from Seattle, the Eastern Caribbean, The Bahamas, and the Mexican Riviera. You can find more of its planned itineraries here. 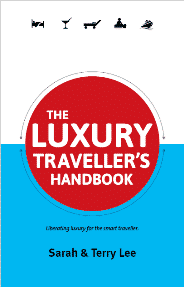 A wonderful, very detailed guide for tourists, thank you! The photos are simply gorgeous! Thank you George, I’m very pleased you found it useful. 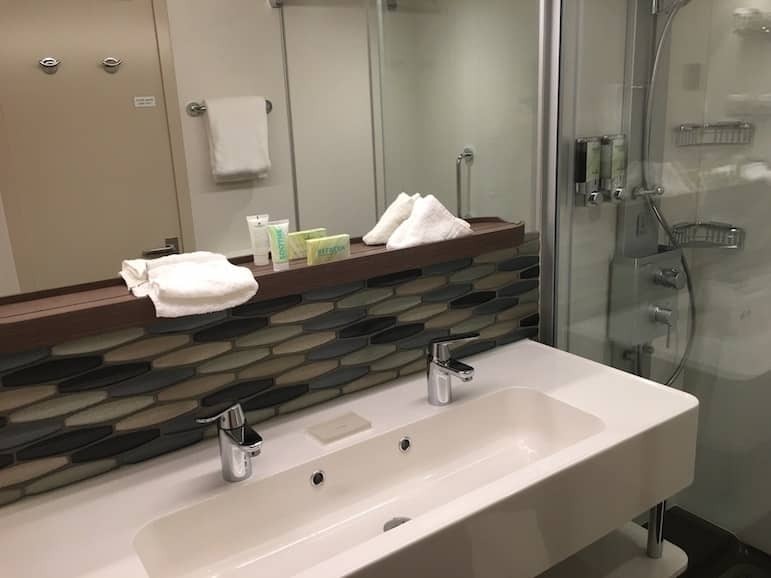 Thanks for the post – I was on the Norwegian Bliss for the inaugural Panama Canal cruise in a balcony cabin on deck 13. The bedroom looked very similar to your cabin (bed and sofa were reversed). Our bathroom was definitely smaller than yours, but still very comfortable for two people. I’m glad you like the review Stacy and also the whole Norwegian Bliss experience. It is a great ship, cabins are fabulous, and I’m a bit jealous that you got to go to the Panama Canal.